Finding your strengths is a rite of passage for many people. You want to discover what you are best at doing. Some people call this working in your genius zone. Today’s guest is Darren Virassammy, COO for 34Strong. Darren and I talk about the importance of strengths. We also talk about finding your strengths and leading others to find their strengths. Join me today in finding your strengths on Leaders in the Trenches. Target Audience: Darren Virassammy is the Co-Founder and Chief Operating Officer of 34 Strong, a new breed of consultancy that gives a voice to disengaged employees by helping organizations like yours become great places to work. A leading expert in the global Employee Engagement community. Virassammy experienced the organizational and personal carnage of disengagement and also relished the power of highly engaged teams. Leaders in the trenches. Your host today is Gene Hammett. Gene Hammett: Hi this is Gene Hammett. I’m your host of leaders in the trenches. My question, for you today is as a leader, do you know the strengths of your individual employees? I love that question because it really is not about finding the weaknesses that are inside them are the opportunities for improvement, but it is about understanding the strengths. I have with me a special guest today, Darren Virassammy, I probably mispronounced the last name, but Darren’s with 34 strong and he runs as a COO of the company, helping companies understand how to better look at the strengths and use the strengths of individuals and their own talents to grow companies and really creating a culture that really is something of a competitive advantage, if you will. 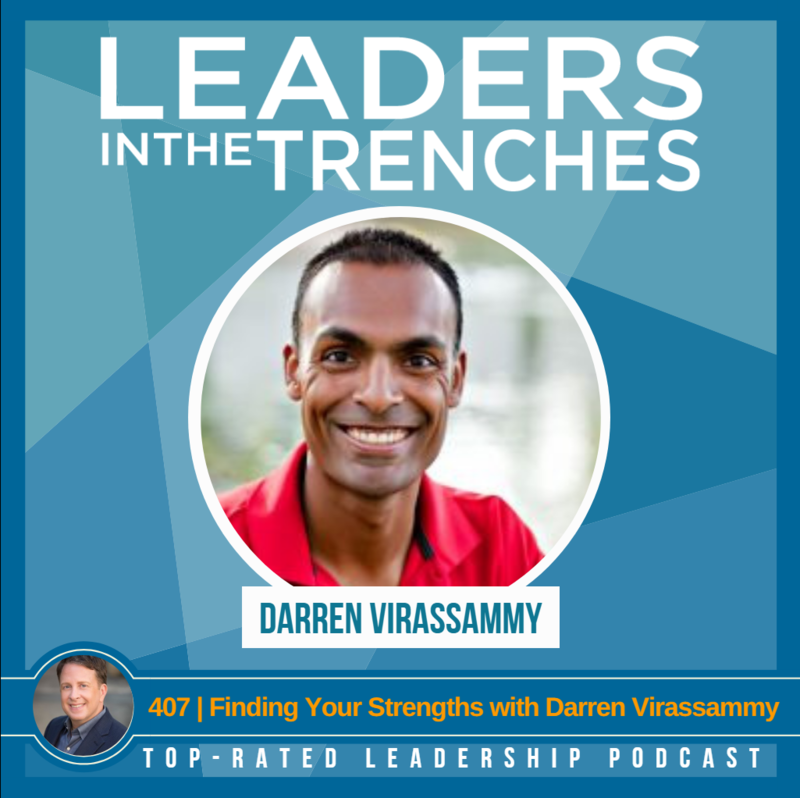 So Darren and I talk about this on the episode about finding their strengths and so make sure you listen to the full episode here at leaders and trenches. Gene Hammett: Hi Darren, how are you? Darren Virassammy: I’m doing great. Gene, how you doing today? Gene Hammett: Fantastic. Excited to have you to talk about a different aspect of leadership and growth. I’ve already let our audience know a little bit about you, so I’d love for them to hear it in your own voice about who you are and who you serve. Darren Virassammy: Well, my name is Darren Virassammy. I am the chief operating officer and co-founder of a company called 34 strong. We are based in Sacramento, California and we worked actually all over the United States, actually all over the globe. We started doing some work down in the Caribbean as well, so that’s not too bad. You know what we really do, Gene, is we believe that every employee deserves a great place to work and that any workplace can be great, but that does not happen by doing a single team building day or just having a fun day or putting pinball machines and there’s some real work that we have to get into to create culture around employee engagement and really focused on a strengths-based approach to human development. Gene Hammett: It’s interesting that you, we start off with, you know, a lot of people think that they can have a weekend or they can do a two-day leadership experience and those things are good. They can be the start of something, but intensity. It’s more about consistency. You’ve seen that? Darren Virassammy: You know? Absolutely. The analogy I love to give Gene is if you think about it, what wouldn’t it be great in January if we could go to the gym on like January 2nd and just work out for eight hours straight, just go grind and see, you know to check that box for the year, I’m going to peg out for the rest of the year. Not Exercise, not doing any of that. What are we really gonna get a healthy life over the course of the year? Absolutely not. In creating culture is much the same way. You can’t do it in just a single barrel swoop. It’s something that we have to sustain over time. What we think we have a focus on culture or we don’t think we have one. We have one. And that you can either be intentional and purposeful in designing it or accidental. Gene Hammett: Well, when you think about culture, you know I’ve got a definition I use within my speeches and when I do with my clients. What would be that definition and how you would describe culture? Darren Virassammy: Yeah, it’s the shared thoughts, feelings, behaviors and beliefs that are held by the majority of your team members. You know, southwest airlines is a great example of this, about the servant’s heart is one of the key values that they have. And you can see that embodied in their employees at all levels of the organization. And that doesn’t just mean serving customers, it means serving just in their community to each other for their team members. That’s just the hallmark of culture because it’s a shared belief amongst the majority of your associates. Gene Hammett: I want to ask you about the name of the company to 34 strong 34 happens to be my favorite number. Gene Hammett: You don’t know that it was my favorite college football player. Gene Hammett: And I want to know where the name came from. Darren Virassammy: Yeah, great question. We do get that question from time to time. So one of the tools that we really work very closely with is the Clifton strengths of the strengths finder 2.0 assessments as a way of identifying talent and how we align talent in an organization. When doctor Clifton did his work and ask the question, what happens when we focus on what’s right with people instead of fixating on what’s wrong with them. He did the research to identify how talent naturally exists within people and what he found, Gene is in his research, he spent 10 years studying almost 2 million people, he ended up finding is there are these 34 buckets of talent or themes as they called that exists in a natural ranked order for all of us from one through 34 and we came up with the name 34 strong basically as a tribute to the fact that all of us are very, very unique in the way that those are going to be ordered. But all strengths are created equal. There’s not good talents and bad talents. We just have who we are and we can all be incredibly strong if we become self-aware and really learn how to aim that potential towards the outcomes that we want to get to. So that’s how we came up with the name 34 strong. Gene Hammett: I like the fact that you have a framework. I don’t use them a lot within my work, but I have used some of them. We have used cliff finders, strengths finders. One of the things that you realize that most people don’t realize when it comes to developing talent? Darren Virassammy: You know, that is, that is a great question. One of the things that we think of what talent is, a lot of times what do we hear? Oh, you’re strong at these things and here are your opportunities, right? A frame that opportunities. And what it actually is is it’s our areas of weakness. So we think of talent a lot of times the human development strategy, the traditional human development strategy that permeates most organizations in our society at large is actually not to identify where you’re strong and invest more time there. It comes at the lens of, Hey, let’s identify where your areas of weakness or your the deficit approach and the thought is that our greatest opportunities for growth and development, why in our areas of weakness, but what the strengths-based approach has found out is our greatest opportunities to top are capacity for excellence individually from our selves standpoint and more importantly from an organizational standpoint, it doesn’t lie in our areas of weakness. Darren Virassammy: It actually lies in identifying where we’re strong. It’s the notion simply of this that the plus for that student that’s not in the top of the box, that’s not the top of where they can get. That’s just a starting point of showing their capacity for excellence. That’s where they can really grow it and make the huge impact is from that a plus going upwards. Gene Hammett: When you think about working with teams and getting them to increase their communication, increased collaboration, improving trust, what is one of the exercises that you do most often? Darren Virassammy: You know, we have an exercise that we utilize and even if people haven’t taken the strengths finder, it’s called grind greatness genius. I believe in the show notes actually we’ve been able to make that a link to that exercise available for your users will be able to provide that for you. Darren Virassammy: So if any of them want to actually go through this exercise, it can be pretty powerful. But what it is that they let you know, Gene, sometimes we don’t get a chance to stop long enough to identify what are the things that I’m doing that I feel really energized? What are the things that I’m really in my genius zone? So the whole point of grind greatness, genius is we’ve broken it into these three different buckets and they’ll see this, the single sheet exercise. But yeah, identify what are the things that you’re doing on a regular basis in your work, in your life, in different areas. And you try and categorize who got instructions on there, the things that are in your grinds on Gene. These are things you might want to consider, ah, Gees, I have to do this. Or maybe I could break my ankle instead. Darren Virassammy: Right? Maybe you get more excited about the concept of breaking your age or as supposed to do that particular task. The things in the zone of greatness, these are the elements that you do that you feel really strong at. And the interesting thing is some of these qualities, Gene can be elements of things that we do that we don’t even realize are actual talents, right? So some people naturally, for instance, just take psychological ownership of what they say they’re gonna do and they just do that and they don’t realize that’s a huge talent because not everybody does that. So that identifies or areas of greatness. And the genius is just the things you are just, you are clearly better than well over a million people at you just do it. So naturally, you’re on that next level. Nobody can really hold the light to you on it. ADVERTISEMENT: Before we jump into the content, let me just remind you that today’s podcast is brought to you by Audible. If you like to listen to podcasts, you probably like to listen to audible books and I want to give you a free 30-day trial. And all you have to do is use this URL, which is audibletrial.com/leadersinthetrenches. That’s the name of the podcast. Just go there, you can buy any book you want and love, beat, abide by the trap of success. That’s my book that came out earlier this past year and if you want to get the 30-day trial, just go to audibletrial.com/leadersinthetrenches and back to the show. Gene Hammett: Now, you mentioned this word ownership and, and I don’t know how familiar you are with my work, but I work with studying the fastest growing companies out there five thousand and I’ve done hundreds of interviews and last year I did a burst of like 51 interviews and the average growth there, those companies were 2700% over a three year period. And I’m looking at the data and what I found was leadership that inspires people to feel like owners and core element behind that is they feel like they’re growing inside the role that they have and that someone really is investing into that and they show up engage to work. How does that align with the work that you guys do though, you know, the strength work and everything else? Darren Virassammy: Well, a big part, it’s a huge part of the equation a big part of the work that we’re doing. So strengths is one piece of the puzzle, but the overarching outcome that you’re working to get to is a sustained culture of employee engagement. And when employees are getting to show up engaged, they are taking that ownership because guess what Gene they’re feeling valued for being valuable, they’re being valued for their unique contributions so they can own themselves. And the term that we really have gotten into utilizing is people can be confidently vulnerable, right? So when you’re really engaged in your work, you can be confident in where you shine and vulnerable and where you’re blind so you can be competent. And where you shine and confident and where you, you’re blind and be able to be on a team where, hey, you know what? Darren Virassammy: I know that I don’t do that incredibly well but I know Gene on my team and I can make that call to him and he gonna have my back and through that greatness can actually transpire. So in that process, we can take the ownership, not just checking the box and getting the task done, but in taking ownership of the outcome that we’re responsible for. Even if there are elements, some of those tasks that we have might fall on the grinding zone. We can still get to that level of greatness with the outcome because it opens up the for the team awareness. Darren Virassammy: that is correct. That is all based on some Gallup data that they’ve had over the years. That was from a study they conducted just a couple of years back. And the reason that’s a key reference point is because that was one of their largest data studies on that, that particular information, but the profitability, the range that you’ll see, same got 14% to a 29% increase in profitability for organizations that have started to shift from this deficit-based approach to human development to one where they’re focused on strengths, identifying what’s right with their people, and really pointing that to the lens of employee engagement. One of the other elements there, there are two other ones that I wanted to bring up as a result of that. Attrition is costly, right? Gene is attrition incredibly costly to organizations, right? And those hyper-growth companies, if you’re just spin off people that can actually detract your growth, not such a helpful way. Darren Virassammy: So the attrition rates, this is an important one and the range is massive. The lower attrition that comes with teams that have adopted this approach tends to be in the range of 6% to 72% lower attrition. Now the big question comes why are there this significant ranges and a big part of it comes to exactly where we started our conversation. Do you want to do the gym workout for the one day on the 5th of January and then pretend like it doesn’t matter for the rest of the year or do you want to create sustenance? The organizations, the companies that were on the higher end of those percentages, where it sustained for the longer term, we’re the ones that embraced folding it into their culture. They didn’t just do it as a single day. The short term introductions, a little blip that you get, it does create a little bit of a bump and you will see that and they were able to track that in their research at the long term, large scale impact took place when it was truly baked into the company culture. Gene Hammett: No. One of the terms I use and I think a lot of companies just have not thought about this, really think about how they need to implement work they do, but they don’t ope-rationalize, which is kind of that step beyond just the teaching or just a step beyond just the two-day workshop. When I say ope-rationalize, I think of like values, like there’s a way to deepen the values cause is that some part of what you do or do you guys phrase it in a different way? Darren Virassammy: That’s a huge part of what we do. It’s, we don’t phrase it in exactly the same way, but we’ve got to take it from the conceptual levels to the strategic levels to the tactical pieces of how does this become a reality. I give you a great example of this. One of the programs that we offer in our larger term, true cultural transformations along the way. One of the steps is a program that we have, it’s called the best manager academy and in this area, managers have gone through the process of where they have had their employee engagement measured. Employee engagement has been measured. We tend to utilize the Gallup Q 12 assessment directly through Gallup in it actually does a great job of measuring that. One of the statements on there that really correlates to trust. That’s the first statement, Gene. It’s, I know what’s expected of me at work. Gene Hammett: Well you mentioned the monthly conversation. My mind went to the one on one. So I’m going to ask, how does understanding the strengths of individual employees may be even understanding your own strengths changed the way those ones on ones are held every week or every month? Darren Virassammy: Great question. So the way that it helps us, it helps us to understand who we are individually and who our team members are and who they’re not. Self-awareness is one critical trait that we all share. Simple example of this, perhaps, maybe you’re somebody that really operates and when you’re in a situation, you’re a team meeting, somebody throws out different questions and you’re able to just very, very quickly stitch towards together, come up, contribute, you know, be shown where you’re communicating. You have clarity on these thoughts and that those dots just connect. There are others that operate where their talents are. They soak up everything that’s said. They’re a sponge. They’re not gonna have that initial response right now, but Gene, you give them the time to think through what they’ve taken in from that meeting and you meet with them the next morning. You’ll be blown away as to what they have to say, but if we put the time on them and say, I need this out of you right now, you’re shutting down a critical part of their talents. Darren Virassammy: Now there’s going to be, you know, a gentle push and pull and there are going to be times where we do need a response in the now, but we’re going to have the awareness of with this person, before I meet with them, they’re going to need a little bit of a primer as to what we’re going to go over so they can come and prepare. This can be others there can operate best when we’re putting it in front of them and they’re just unpacking it as it goes. You’re able to get into that understanding of how your people think, those that you lead that is in your care as a leader, how to best connect with them, how to best motivate them, how to best-set expectations for those, those different elements. Darren Virassammy: you know the best way to get in touch with play with 34 strong is just visit 34 strong.com you can also find us on Facebook, linkedin. You can find me on those vehicles as well. Be happy to connect with you and answer any questions and again, you’ve got that grind greatness, a genius link that’s available for all of your users. I think it’d be a really powerful exercise for them to gain that clarity on where they really shine. Gene Hammett: Well, thanks for being here. Darren Virassammy: Thank you so much for having me, Gene. Truly a pleasure. Gene Hammett: All right, that was a great episode. I love this conversation because I really see the power in having a strong culture and having much more insight into who you’re leading. There’re so many tools out there, so I wanted to get a perspective of what some of those tools are shared that with you so that you can make some smart decisions about what you need for your company. If you are questioning what you need and you want to have a conversation and someone who has a very objective perspective of some of these tools, I’d love for you to reach out to me. I’d love to engage that conversation with you. We just have a quick chat to get to know you and what you’re doing. As always, lead with courage. I’ll see you next time.